In the brand-new trailer for Skyscraper, Dwayne Johnson's Will Sawyer character tells his son, "In order to be brave, you gotta be a little scared... I need you to be brave right now," which is exactly what the whole moviegoers are going to have to repeat to themselves while watching it in theaters. The roughly 3-minute trailer will make anyone who is afraid of heights squirming in their chairs as they watch Johnson scale a super crane and make an epic jump to the world's tallest building. That being said, the latest Skyscraper trailer is definitely not for the faint of heart. Action megastar and all around good dude Dwayne Johnson stars in Skyscraper as former FBI Hostage Rescue Team leader and U.S. war veteran Will Sawyer, who now assesses security for skyscrapers. On a new assignment in China he finds the tallest, safest building in the world suddenly ablaze, and he's been framed for it. As a wanted man on the run, Will has to find those responsible, clear his name, and then somehow rescue his family who just happens to be trapped inside the building above the fire line. Johnson is the right person for the job. In addition to Dwayne Johnson, Skyscraper also stars Pablo Schreiber (Orange is the New Black), Neve Campbell (Scream), Noah Taylor (Preacher), and Byron Mann (Altered Carbon). Campbell plays Johnson's wife and the mother of his two children who also is seen in action in the new trailer. Campbell can be seen stabbing an enemy and stealing his weapon to save her son's life and is later seen walking a fiery tight rope. Skyscraper looks an awful lot like Die Hard on the surface, but there's clearly some other elements going on to separate itself from the iconic action movie. Skyscraper was written and directed by Rawson Marshall Thurber (Central Intelligence). Additionally, the 3D action-thriller is produced by Beau Flynn (San Andreas), Dwayne Johnson, Thurber and Hiram Garcia (San Andreas, Central Intelligence). Skyscraper's executive producers are Dany Garcia, Wendy Jacobson, Eric McLeod, and Eric Hedayat. Johnson continues his career as one of the hardest working actors in the business, fresh off of the success of Jumanji 2 and Rampage and now diving head first into The Jungle Cruise movie, one has to wonder if the man ever sleeps. Skyscraper will open in theaters on July 13th, which is a week after Marvel's Ant-Man 2 makes its debut. Dwayne Johnson's last project, Rampage, was a modest success, but it was lost in the shuffle of Marvel's Infinity War, which is still out breaking box office records. Skyscraper is offering something completely different from the MCU style and offers what looks like the perfect popcorn movie for the summer of 2018. Set aside the worries of Die Hard and The Towering Inferno plagiarism and just sit back and enjoy the intensity. 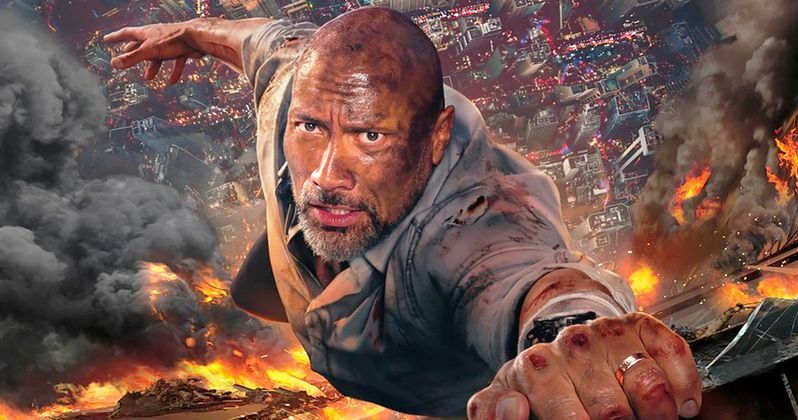 Watch the latest trailer for Dwayne Johnson's Skyscraper below.